“The Immortal Coil,” by J. Armand, is a sci-fi fantasy (with action and horror elements) that follows a young man as his life is turned upside down by the arrival of otherworldly intruders. The novel opens with Dorian, an aspiring model, at a casting call. His life seems normal – the hunt for work, relationship with his family, experiencing a new place – until he sees a CDC van in his neighborhood. Strange, right? Turns out, it was just a small sign of what is to come – an encounter with terrifying mutant creatures. Dorian finds himself on a life-or-death adventure, learning about the creatures and trying to figure out a solution. He meets some interesting characters along the way, such as Noah, a martial arts expert whose weapon of choice is a short version of the katana. 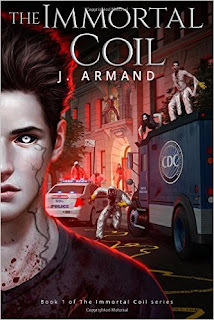 Armand does an excellent job balancing scifi/fantasy world building with lots of action and adventure. I’m a huge fan of fight scenes, and was pleased to learn Armand writes gripping, vivid scenes that put you right in the thick of the action. I'd recommend this book to anyone who is a fan of sci-fi fantasy with lots of action.